Traveling to NYC with a toddler? You probably figure you'll have to save the Broadway theatrical experience for when your child is older. But not necessarily! 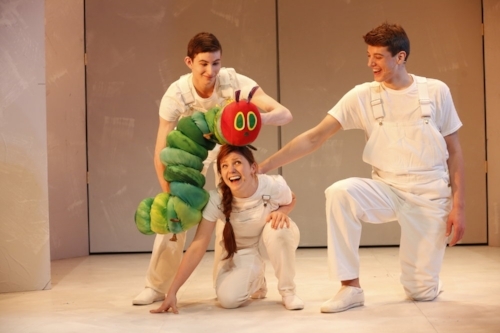 If you love the theater, try to catch a live performance of The Very Hungry Caterpillar Show at Union Square before it ends its current run on May 20. My husband and I took our almost 2 year old daughter to The Very Hungry Caterpillar Show, to rave reviews all around. The show adapts four of the author/illustrator Eric Carle's books - Brown Bear, Brown Bear, What Do You See? ; 10 Little Rubber Ducks; The Very Lonely Firefly; and of course, the infamous The Very Hungry Caterpillar. The stories are brought to life with 75 puppets, manipulated by three on-stage storytellers/puppeteers. I'd describe the show as the poor man's Lion King on Broadway - with absolutely no disrespect to The Very Hungry Caterpillar Show. I simply mean that you get the same style of performance, with many vivid, beautiful animals brought to life through fun puppet design and movement - for a fraction of the cost of a Broadway ticket to Lion King. 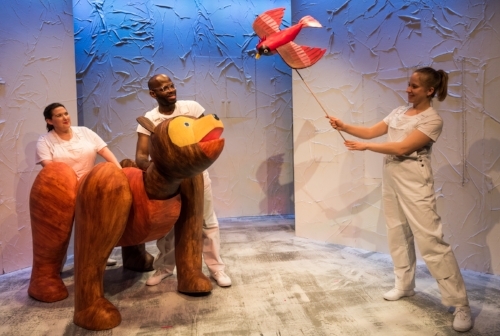 For us parents, it was interesting - and sometimes downright thrilling - to see how the production brought elements of each well known bedtime story to life. And of course, it's always fun to see the looks of awe and wonder on your toddler's face. Better yet, the production avoids all of the elements that make a Broadway show untenable with a toddler in tow. Performance time for The Very Hungry Caterpillar Show is a mere 50 minutes; shows run on Fridays and the weekend at 10am, 12pm, 2pm and 4pm, so there's bound to be a time that fits around naps; and the show is housed in the intimate DR2 Theater (103 E 15th St), far away from the overwhelming hustle, bustle and flashing lights of Time Square. 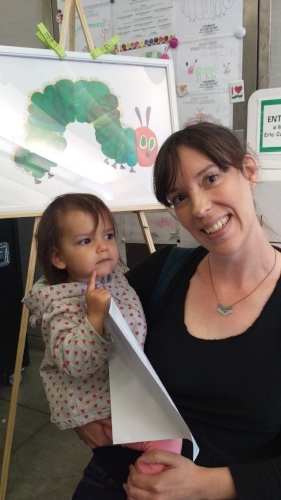 The Littlest Passport recommends attending the morning performance of The Very Hungry Caterpillar Show with your toddler (while everyone is at their freshest), bookended by a relaxing exploration of adjacent Union Square Park. Below is a Tiny Itinerary that allows your family to explore the best that New York City has to offer - live theater, a delicious farmer's market in the middle of Manhattan; and a playground visit and relaxing lunch al fresco. 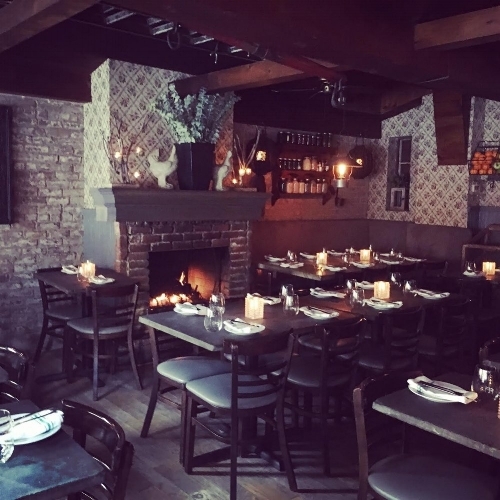 If you and your child are super early risers, consider heading down to Gramercy Park (a five minute walk from the DR2 Theater) to have a toddler-friendly sit down breakfast at Friend Of A Farmer (77 Irving Place), a farm to table concept restaurant with an interior made to resemble a Vermont farm house. The restaurant opens at 8am and even takes breakfast reservations during the week (though not for weekend brunch, so arrive early) and offers a Kids Menu. The menu includes delicious omelettes; killer pancakes and french toast; cornbread while you wait and "farm to glass" fresh juices. Try the Brooklyn Beautifier, with fresh cranberry, raspberry, and blueberry. Toddler-friendly Friend of a Farmer in the Gramercy Park/ Union Square area - delicious farm to glass juices, cornbread and more. If you and your toddler are late risers or prefer a leisurely start to your morning, then fuel up with a full breakfast at your hotel/ home rental before heading down to Union Square - you won't want to feel rushed or underfed. If you're not staying in or around Union Square, and will be taking the subway (14th Street - Union Square Station is right across the street), keep in mind that you'll want to give yourself plenty of time to get down to the DR2 Theater - build in time for traffic or subway delays, and getting lost or directionally disoriented at least once. If you do arrive early, you can grab an excellent cup of espresso coffee at Everyman Espresso (136 E 13th Street). Their cortados (espressos with a small amount of skimmed milk) are second to none. Though the cafe does offer a small selection of locally sourced baked goods, don't rely on eating here - the selection is too limited, and doesn't comprise a healthy or well rounded breakfast. Also, seating is limited, so expect to grab your coffee to go. Or if you're feeling adventurous with your caffeine fix, head to Le Cafe Coffee (7 E 14th St). Here you can try one of several unique drinks, including rose, lavender and matcha lattes. Then head to Union Square Park with your coffee, where you can sit on a park bench while your toddler excitedly points out all the squirrels, pigeons and flowers. (There is a toddler appropriate playground at the north end of Union Square Park, but if it will be a battle to get your kid to leave the playground for the theater, consider leaving the playground visit for after the show). DR 2 Theater doors open 30 minutes in advance of show time. The theater is intimate, so there won't be long lines to collect tickets, enter the theater and find your seats - though you'll want to give yourself a bit of time to go to potty and settle in. There is a pint sized table and chairs in the theater lobby where your toddler can grab some crayons and Hungry Caterpillar coloring sheets, so don't worry about your little one getting restless if you show up early prior to showtime. The House Manager has pictures they can show your little one if they are nervous about entering the theater. I was worried that our 22 month old might get a bit overwhelmed once we arrived at the theater, so we gave ourselves a few minutes in case we needed to ease her into the space. We also spent time in the weeks leading up to the performance showing her the promotional video, and reading all the stories to her, so that she was familiar with - and excited by - what she'd be seeing. Autism Friendly Performances: The show was designed to be autism friendly, and a number of accommodations are made to ensure that caregivers can relax and children can enjoy themselves. If you have a child on the autism spectrum or with sensory issues, review the FAQ page for more information on how the production can support your family prior to and during the show. Strollers: The production warns that there is limited space for stroller parking, and that strollers will be left unmanned during the show. Therefore, the show suggests you leave your stroller at home if it's not necessary. We heeded the advice and did not bring a stroller, thinking it would be a hassle. However, we noticed that the stroller "parking lot" was not full at our performance. The stroller area is tucked away from the entrance, minimizing the risk of a stroller being stolen (though of course the theater is not responsible for stolen items, and you should always keep valuables on your person). In short, if being able to transport (or contain) your little one in a stroller is best, don't be afraid to take your stroller. Where to Potty: There are two family bathrooms in the theater space, one with a change table. Again, because of the small theater size, there weren't long lines for the bathrooms, but do be sure to encourage your little one to pee before the show. Where to Breastfeed: There is no designated space to nurse outside of the theater itself, which has dimmed lights before the show. Snacks: The theater does not sell water, drinks or snacks, so be sure to bring your own. There are sometimes discount codes available for certain shows, so be sure to do a quick Google search for any codes prior to buying tickets. The Very Hungry Caterpillar Show - Brown Bear, Brown Bear, What Do You See? Though the performance is slowly paced for toddlers, I found that my daughter was more hyper than usual after the show. With the subway or taxi ride, the new surroundings and seeing storybooks animals come to life, the morning is one full of excitement, so it's best to keep the rest of the post-show morning low key. Fortunately, this is easy to do if you stick around Union Square, which has plenty to do for toddlers. Though you could Google "kid friendly restaurants in Union Square" and drum up a couple options, The Littlest Passport suggests skipping a loud, crowded restaurant for lunchtime. Instead, head to Whole Foods (4 Union Square East) on the south side of Union Square Park for a prepared lunch. Take your lunch back to the park, which has plenty of shady benches and even tables and chairs for a relaxed meal outdoors. The Union Square Greenmarket happens on Mondays, Wednesdays, Fridays and Saturdays, where you can pick up bread, fruits, cheeses and a limited amount of prepared food. However, you'll need to bring cash, and may find prepared lunch selections limited. After eating, take the little one to Evelyn's Playground at the north end of Union Square Park. There is a dedicated section for toddlers (well shaded! ), with swings, a sand area and climbing structure. My daughter loved the sand box area, and I loved the thoughtful design - with a toddler height surface for kids to play without having to sit in the sand, and steps around the sand box where parents can comfortably sit within arms reach of their youngsters. There are bathrooms inside the playground, as well as in the Barnes & Noble (33 E 17th Street) children's section, located across the street. Note that there are a number of gates (exterior and interior) to keep the little ones safe and secure in the playground. Though the playground is set back from surrounding streets, the roadways outside of Union Square Park are busy - so do all the families a favor and ensure that you close each playground gate behind you when entering or exiting any section, so no little ones escape. The whole family will be ready for a rest after an exciting morning. Especially if you're taking the subway back to your hotel or apartment rental, give yourself plenty of time to get home before nap time. You don't want to have to navigate multiple flights of subway steps with a cranky, melting down toddler - or one who has fallen fast asleep.